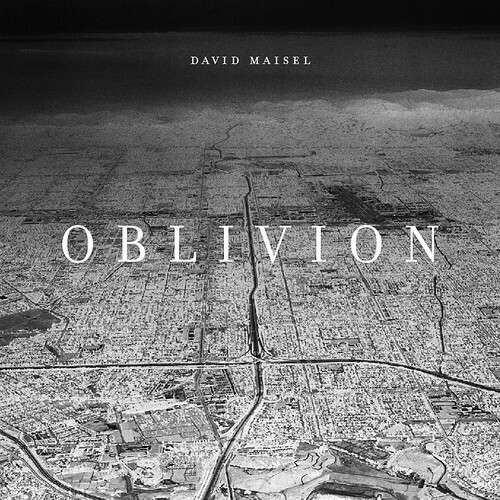 As many of you will no doubt know, I interviewed photographer David Maisel back in March for Archinect. As it happens, Maisel has a new show of photographs opening up this weekend at the Paul Kopeikin Gallery in Los Angeles (6150 Wilshire Boulevard), and he'll be at the gallery tomorrow night, October 21st, from 6-8pm. 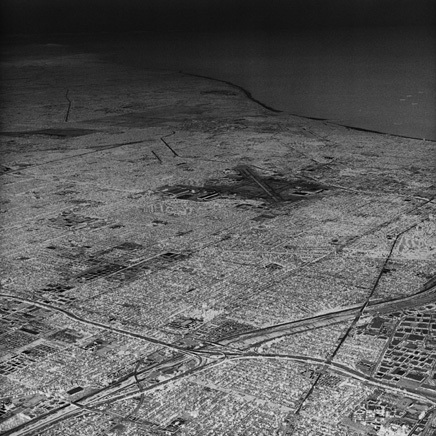 Getting permission to fly over the city was fraught with difficulty; the possibility of an airplane somehow turning the urban fabric into the site of an Armageddon-esque conflagration was implicit. At the same time, the meaning of "looking" within an urban environment has changed; it’s now more akin to an act of surveillance. Who gets to look? Who controls the gaze? Who controls the information seen? Who is or is not permitted to photograph the railroad tracks, the subway station, the public building? Is it unlawful to do so without permission? And who, or what entity, is given the power to grant such permission? By what authority is that bestowed? 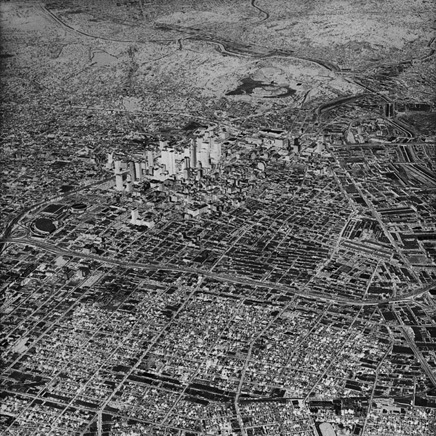 Elsewhere, on his own website, Maisel adds: "Certain spatial fears seem endemic to the modern metropolis, and Los Angeles defines this term in ways that no other American city can approximate. This amorphous skein of strip malls and gated developments, highway entrance and exit ramps, lays unfurled over the landscape like a sheet over a recalcitrant cadaver. Surely the earth is dead beneath the sheer weight and breadth of this built form?" The skyscrapers of downtown are now axonometric figures in a virtual reality, as if displayed in a Computer Aided Design program, and the course of the Los Angeles River is indistinguishable from those of the freeways. The oblique view... lays out a city as elaborate as that of a Persian carpet, yet it is as white as if it had been incinerated. What presumably is a blown-out, overexposed sky above the hills in the background is instead a black void that glowers over the city. It’s how an X-ray looks, how we imagine the military sees the monochromatic world when surveilling it at night. It’s as if we are seeing what the artist refers to as a “shadowland,” a place previously unobserved that coexists with its sunstruck version. So come out if you can, meet David (and possibly meet William Fox? ), and potentially even meet me, though I'll just be there as a spectator. It should be a good night. Bring your friends, your Romans, your countrymen – as well as a few bucks so you can buy a signed copy of the book. i was really hoping to see those pictures. these are quite striking too - but i was a bit disappointed when i first saw them, as turning images negative isn't that visually interesting to me and doesn't seem like a terribly creative choice. The title of this post intrigues me--do you mean to suggest that the x-ray is itself an agent, that what Maisel's photographs broach, in part, is a way of seeing x-ray-like? An interesting idea. But, for one, the photographs appear to have been solarized, a photographic process that reverses tones (it does _not_ turn a photograph 'negative'), whereas an x-ray 'print' is a shadow, indicating where bone structure exists. So, do you mean to suggest that this set of photographs are x-ray-like in that structures--architecture and such--is the light-impenetrable mass, whilst that-which-is-not-architecture-and-structure is flesh? deepstructure, do you mean this post? If you do get a chance to see the photos anyway, in person, give it a shot; they're physically impressive at the very least, and the inverted effect benefits from the larger scale (the prints are 4-foot square). But some things aren't for everyone... Still, if you have a lunch break to kill some future workday, stop by. And the "x-ray" comment is actually an excerpt, or quote, from the William Fox essay, in the body of the post (above); the implication is not that these are, in any way, actual x-rays of the city, but that they superficially resemble medical x-rays, and thus serve, metaphorically, as aerial diagnoses of the city. Where the city itself becomes vaguely cancerous. At least that's how I read it, and why I titled the post that way. If you're in LA, come see the show. Do you mean this Trantor? I am writing a book (partly) on a nuclear detonation in Tokyo in 2008. I think I will use this technique to show Tokyo post-explosion. It does give the eery sensation that the city is life-less, although the tallest buildings appear in tact. I'll have to research whether modern skscrapers could withstand a small-yield nuclear blast. But after viewing 9/11 photos, I seriously doubt they could.